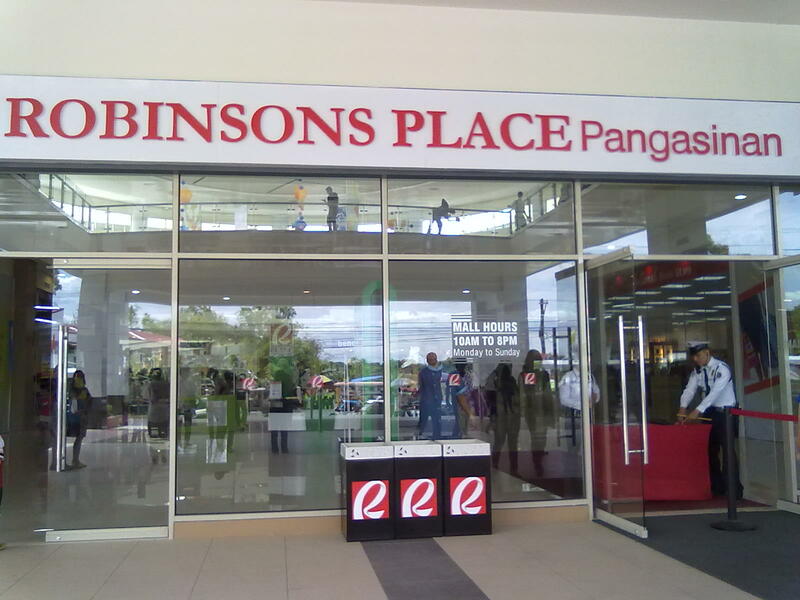 Robinson’s Place Pangasinan is now open to serve you. The grand opening was held last Sunday, March 25, 2012. The mall is located along the highway of Calasiao, Pangasinan. It’s close to where Jolibee Calasiao (intersection) is located. 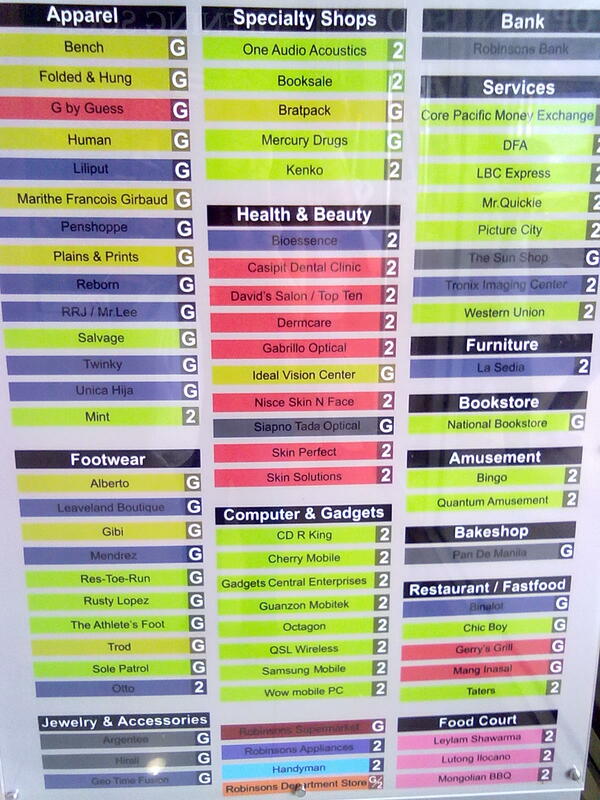 For the list of establishments currently open, please refer to the image below. Click on the thumbnail in order to view a larger size of the picture. We paid the mall a visit yesterday and made a quick tour of the whole place. It was just coincidental that we had itineraries on the same day at a nearby location. We dropped by Aguila Auto Glass Dagupan to follow up the request for a windshield compatible with our mini-car. See this post Think Twice Before You Park Your Car Just About Anywhere. 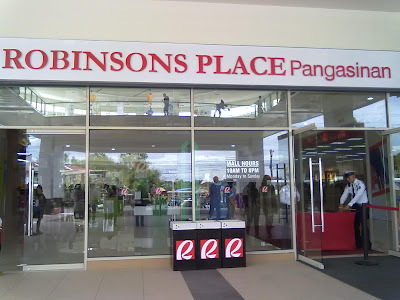 Going back to the mall visit, there is a striking similarity between Robinson’s Place Pangasinan and SM Rosales (also in Pangasinan). The only difference is that instead of extending in horizontal space, Robinson’s was designed with a second floor and extended is vertically. As for the shops, there are still empty stalls. A friend was there before the grand launching and mentioned that only a few spaces were open during the soft launching. The grand opening at least offered more shops to check out and only a few remained closed. The movie house too only has two cinemas currently offering movie plays. Most of the shops are either only available locally or are associated with national brands. None of the popular fast food chains were present however. It can be because there are already branches of such restaurants nearby. Refreshingly, Mang Inasal, a slowly emerging food chain is present, along with Chic Boy. The latter had also recently opened a branch adjacent to Magic Mall Urdaneta. Some of the usual names you’d find in Robinson’s Place are also present, one of which include Handyman, an alternative to the DIY and Ace Hardware. These two boasts a greater following in the country when it comes to home improvement and hardware products. Although it’s the first time you’ll see an actual Robinsons name in Pangasinan, the company is nothing new to the province. Nepo Mall Dagupan is actually associated with this brand, although local Magic Mall holds a larger share. With SM Rosales already existing in the eastern side of the province since 2008, it’s high time that one of SM’s fierce competitions put up a branch in the same province, if not within the same town. If you are from Pangasinan, a Robinsons Place obviously impacts you. Everyone residing in the same town (Calasiao and nearby areas) where it is located can now conveniently shop without the need to head over Dagupan city’s malls – Nepo Mall, CSI City Mall, etc. Business wise, it is disadvantageous for those who are associated with the other malls, but for everyone nearby, whether they own a stall in Robinsons Place Pangasinan or not, are benefitted. Improvised snack outlets which were not present in the area before now fill the opposite side of the road across the mall. Public transportation is now open on opposite ends of the highway as well. The gateway for more employment opportunities also increases for local residents. Tax collection for the local town where the mall is located (Calasiao) will help fund local projects. All in all, it benefits the entire province of Pangasinan economically. Our visit at Robinsons Place Pangasinan in Calasiao, Pangasinan was short and we didn’t really scrutinize the entire mall. We only had a quick snack and dropped by the arcade. As for you, if you are residing nearby and if you haven’t paid this mall a visit, it's time for you to do so now.